Art is more than a hobby for me. It's a passion, the way I capture and celebrate life. In this album, I've assembled some of my favorite art pieces. On this page, I might describe common threads among my art, and talk about the themes I try to explore with the medium. 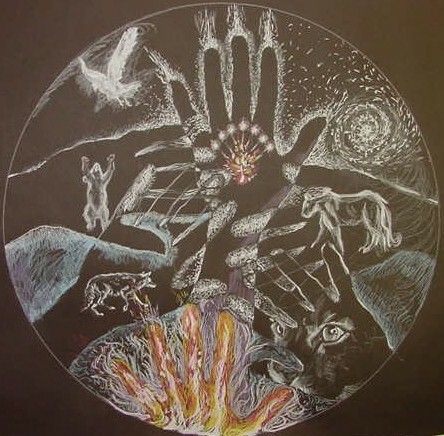 I'll also include one or two representative art works on this page. Thanks for dropping by and taking a look at my art. Please be sure to sign my guestbook below when you're done! 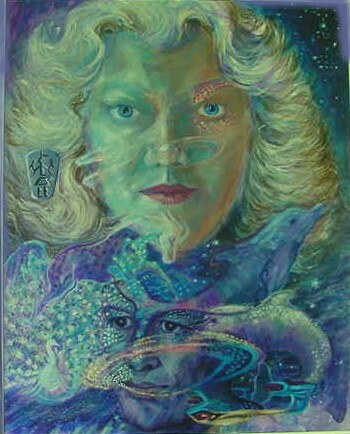 This is my Sci-Fi portrait, done around 1992. I work in acrylic. Sometimes my work is from an interior landscape, sometimes it is from an exterior landscape. I like working from nature. My feathers are from our peacocks. Feathers are left just as they are found. I think it keeps the original energy of the bird in them, or I am just not into washing feathers. The feathers have the original energy of the bird,plus the added energy of the animal totem painted on them.